This week has been glorious, weather-wise. Summer temperatures in April and yesterday, May 1st, our outdoor thermometer registered almost 30°C! Lucky for us we did manage to get our patio into fine shape by picking up a couple chaise lounges and some reed fencing and have been enjoying the outdoor weather in comfort. Yesterday we had a barbecue with some friends and stayed outside until well after dark. I know the rains will be back, so I’m trying to soak up as much of this early summer weather as possible. 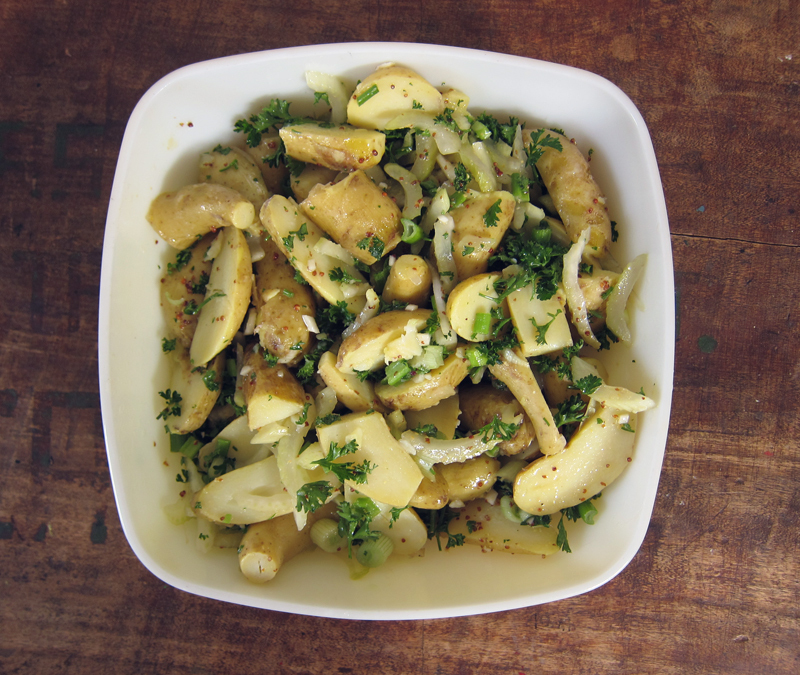 And this lovely potato salad that I served last night is one way to kick off summer in fine form. It’s from Deb’s cookbook and it’s a light tasting salad that requires no gloopy mayonnaise. The only bit of prep work is making sure you pickle the celery ahead of time. I started it in the morning so it was ready at dinner, but 30 minutes ahead of time should work too. To cut down the prep work even more, cook the potatoes the night before and refrigerate them overnight so that they’re well-chilled and easy to work with the day of. I made a few changes from the original recipe – doubling the celery because pickled celery deserves to be doubled in my book. And I threw in some parsley and scallions for extra colour and flavour. I didn’t have a shallot for the dressing so I used garlic instead. No harm done. I was a little wary of pushing egg slices through a fine mesh sieve, but it worked like a charm. You can finely chop the egg instead, but I really liked the fluffy texture using a mesh gave to the eggs. They looked pretty too. And if you’re vegan or wary about eggs, leave them out. Enjoy this summer-ready salad. Perfect for picnics, barbecues and other outdoor meals. Or dig in when the rains come back for a taste of early summer. Combine pickle ingredients and swish around the liquid with a fork to dissolve salt and sugar. Cover bowl and refrigerate. Pickle your celery at least 30 minutes beforehand, but the longer the better (I let mine pickle for 8 hours). In a small jar, combine the vinaigrette and give a good shake, taste and adjust seasoning, if needed. Slice potatoes lengthwise and then in half widthwise if too long. 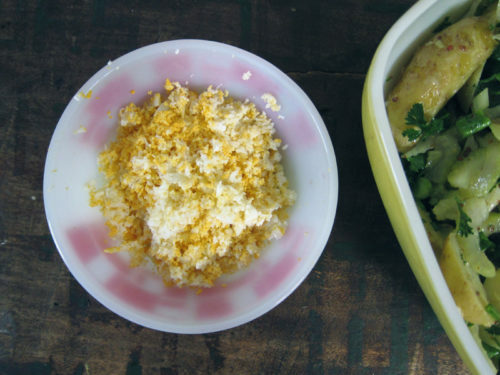 Place in a bowl with the scallions and parsley. Discard the pickle liquid and add in the pickled celery. Toss salad with the vinaigrette. Press the egg quarters through a mesh sieve starting with the yolks to get egg fluff and toss once again. Serve immediately. 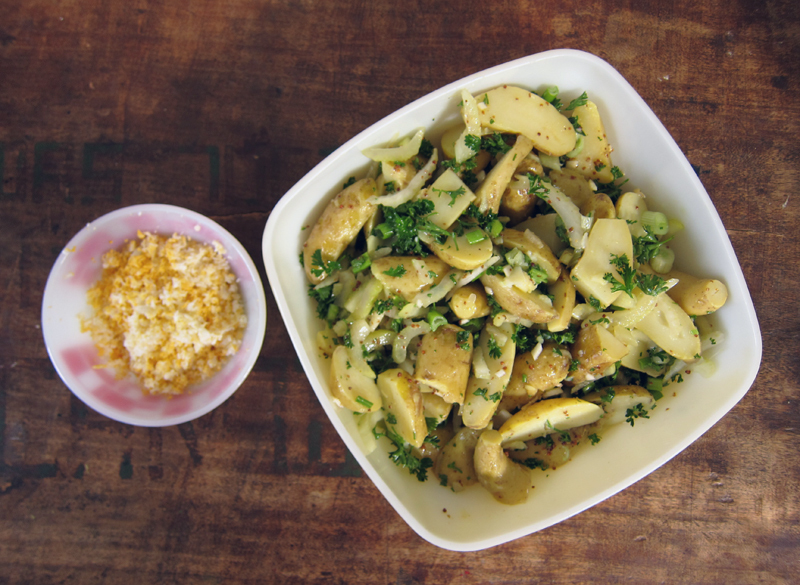 I love potato salads – one of my favorite parts of summer! I’ve never added or made pickled celery but it sounds delicious! I love that idea! Mmm! This potato salad looks fantastic! I like how you prep things in advance just like the pros in restaurant kitchens 🙂 Lucky you that the weather in Vancouver is summer-ish. The weather here is just awful, cold & rainy all the time. The other day when I was walking the dog, I could see my breath as I was exhaling in the cold air. I’m going to bookmark this salad as I plan to have a picnic or two this summer. 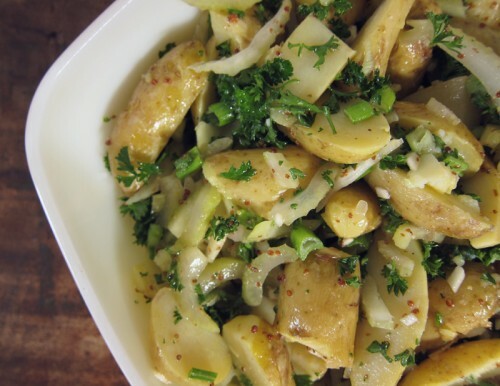 This potato salad looks wonderful, love the fact there is no mayo involved. As far as pickling the celery I’m all for that. Happy week-end to you! Maria, it’s not summer yet, but it’s nice to get a jump on it with this potato salad 🙂 Thanks!! Joanne, ha! I do like to be a little organized in the kitchen or I’ll forget to add something! I talked to my dad and he said they have nice weather now, so yay!! Cheri, me too, hooray for no mayo! Petra, so glad you’ve enjoying this salad. It’s a new favourite over here.